The Spanish Embassy in Tirana, Albania, is pleased to invite you to the "Lo Cortés no quita lo Gallardo" guitar concert on June 19th at 19:00 at the Concert Hall of the Orthodox Cathedral. 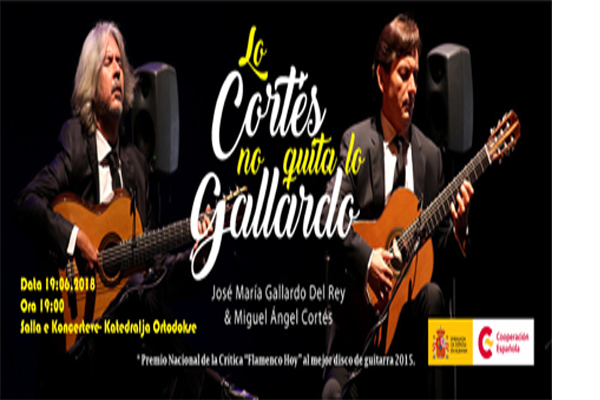 Artists José María Gallardo del Rey and Miguel Ángel Cortés, winners of the "Flamenco Hoy" Award for the Best Disco Guitar 2015, will make us experience an unforgettable evening unfolding with sublime technique and subtle symbiosis between the classics and flamenco. Entry is free!